"One of the key areas where we would like to work more in future is people-to-people exchanges," French Ambassador to India Alexandre Ziegler said. Panaji: India and France will work on promoting people-to-people exchanges, which is one of the important areas in the strategic partnership between the two nations, French Ambassador to India Alexandre Ziegler has said. The pillar of the bilateral relationship is the strategic partnership, he said. "One of the key areas where we would like to work more in future is people-to-people exchanges. There is no point in talking about strategic partnership for next 50 years if you don't prepare the next generation," Mr Ziegler told PTI in an interview. 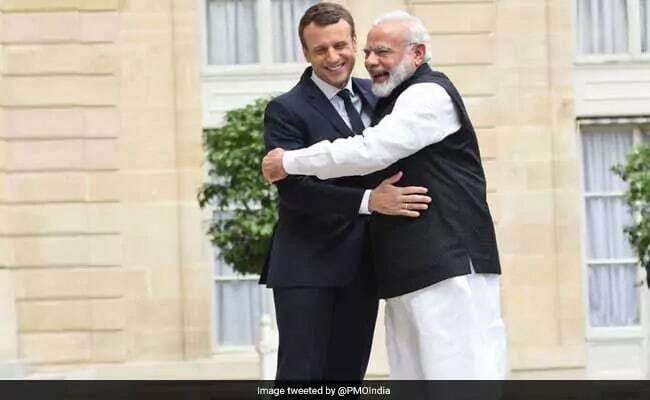 French President Emmanuel Macron, during his visit to India last week, had rolled out the red carpet for Indian youths, researchers and entrepreneurs, saying he would be proud if they made France their entry point to Europe and be their "long time strategic partner". "During his visit to India, our president stressed on educational cooperation, research, attracting more Indian students, French students...and I think this enhancement of people-to-people exchanges will be one of the key issues of our relationship in future," the ambassador said. "That is the agreement on mutual recognition of our university degrees which will increase an influx of students, either French or Indian, visiting partner countries," he said. The two countries also has an inter-governmental agreement on migration and mobility, which will further ease access to visa, like working visas to students and researchers who want to enter France, he said. Reflecting a growing depth in defence ties, India and France earlier this month inked a strategic pact providing for the use of each other's military facilities, including opening naval bases to warships. The agreement came amid China's growing military expansion in the Indo-Pacific region. However, Mr Ziegler said, "the accord is not aiming at decreasing anybody's influence. It is a recognition that India and France are both Indian Ocean marine countries." Both the countries share common challenges in the form of terrorism, piracy and freedom of navigation, he said. There are two million French citizens living in the Indian Ocean region, he said. During the meeting of heads of both the nations, there was a joint statement over their cooperation in the Indian Ocean, Mr Ziegler said. "We also had an important inter-governmental agreement with effects on our military cooperation on reciprocal logistical support, which means access to our naval bases all over the world," he said. "The second is general security agreement which allows us to exchange classified information and documents that will help in improving our naval cooperation," he said. "Both the nations are facing similar challenges in the Indian Ocean. The idea is to address these challenges together because we are a part of the same region," he added. Alexandre Ziegler is in Goa to witness the Indo-French joint naval exercise 'Varuna-18', which commenced on March 19 in the Arabian Sea off the Goa coast. The ambassador said this year's exercise is very important and symbolic, considering the visit of the French president. "It is an important exercise. We have been doing it for last 35 years. It started in 1983. France was the first partner country with whom India engaged in regular naval exercise," he noted. "For us, it's a very important and symbolic exercise. This year's edition is all the more symbolic as we had the presidential visit just a week ago and they agreed on some important issues on our cooperation in the Indian Ocean," he said. This year, the idea behind the Varuna exercise is to further enhance and improve the cooperation between the two countries. "It is not an exercise where naval officers will meet and exchange information. The idea is to make them operational as much as possible. The fact is that India is engaging its important ships in the exercises plus naval elements, speaks a lot on what we want to do," he added.